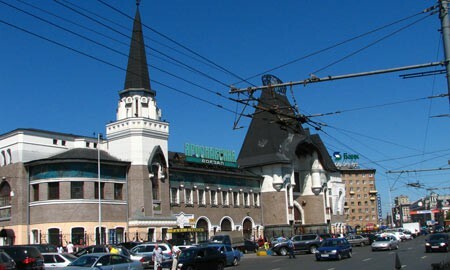 Yaroslavsky train station is one of nine train stations in Moscow. It has the highest traffic flow among all Moscow train stations serving mainly eastern destinations, including Russian Far East. Yaroslavsky train station is a start point of Trans-Siberian railway, the longest in the world. The train station was named after the ancient city of Yaroslavl, the first large city along this railway. 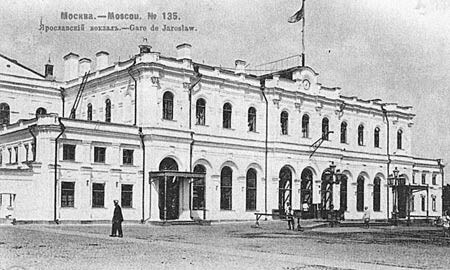 In old photo one can view the first building of Yaroslavsky train station constructed on this site in 1862. It was substituted with Shekhtel's building erected in Neorussian revival style in 1902-1904. The new train station was under the renovation a few times and underwent some changes. Though it managed to preserve main features of Russian architecture. It is a blend of fairy-tale and art-nouveau style. Moscow tour guide will show the start point of Trans-Siberian railway.